Please visit my blog and let's discuss the global scene. My dog and I travel widely. 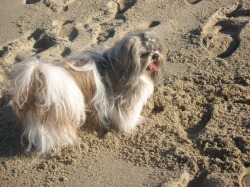 Having my small friendly dog on the trail breaks down barriers of nationality, culture and even language. His magnetic personality leads towards all kinds of encounters which create their own dialog with the syndicated global news- a dialog that is often alarming, off putting and driven by political perspective. Along the way, I give all sorts of tips about canine travel like how to stay healthy, which museums will accept your dog, what Puerto Rican stew your dog might like, how to choose a portrait artist in Montmartre, and if your dog needs traction boots in the high Atlas Mountains (he sure does) . Share our adventures & post your thoughts: click on the "Global Travels with A Dog" blog tab! Find more dog training info here!